Magna-Power Electronics (MPE) was founded in 1981 with the intent of being a power electronics, lighting, and magnetics research and development (R&D) company. The company and its founder’s career pivoted several times before settling into its niche of engineering, manufacturing, and selling high-power sources and loads. This article chronicles the milestones in the company’s history that has defined its eventual path to success. The founder, Ira J. Pitel Ph.D., started the company to better leverage his education and skills from prior work. He received his undergraduate degree in electrical engineering from Rutgers New Brunswick campus in 1972. Afterwards, he worked one year for Lutron Electronics in Coopersburg, PA. At this time, the SCR was well established  and companies were actively integrating these devices into appliances such as lighting and ovens. The experience exposed Ira to power electronics and the new world of semiconductor controlled lighting. He continued his work on lighting at his next job, GTE Sylvania in Williamsport, PA. There, he completed his masters degree at Bucknell University in 1975, and met Elva Joy Pitel, who also worked for the company. His next career move was going back to school to improve his professional credentials. Upon acceptance into Carnegie Mellon’s Ph.D. program, he hastily got married, packed his bags, and moved to Pittsburg, PA in 1976. Under the guidance of his advisor Sarosh Talukdar and mentor Peter Wood, he graduated in 1978. Shortly after, he landed his dream job at Bell Laboratories in Whippany, NJ, as technical member of staff, and moved back to his home state. Ira quickly became frustrated with company bureaucracy and explored other opportunities through engineering consulting on the side. Eventually, he left Bell Laboratories to work for Exxon Enterprises in 1979, a division of Exxon Corporation. In parallel with his jobs for large corporations, his private consulting business and reputation were growing. 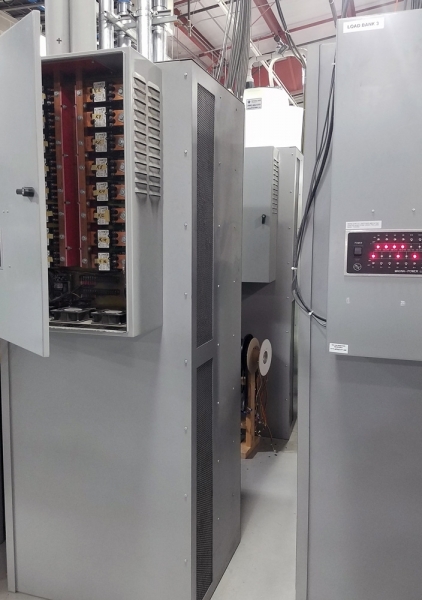 The business was located in the basement of his home at 2 Lohman Road, Morristown NJ, where he exercised the 1,100 ft2 space and a 240 V, 50 A electrical feed to its full capacity. He had started taking on work for custom power supplies for lighting controls, lasers, and designing custom magnetic components. The space was eventually used for low-volume production runs of magnetic components. The family oven was used for baking transformers. Neighborhood tranquility was disrupted by tractor trailers making steel deliveries. For Ira to grow the business and get larger prospective clients to take him seriously, he needed dedicated space. A grant from the recently established Department of Energy (DOE) gave him the impetus to purchase an office building in Whippany. At the time, the United States had just recovered from an energy crisis and was forming policies, agencies, and grants to protect itself from another crisis. In direct response, the DOE was created in 1977. During the same time period, the National Science Foundation (NSF) started managing a small research portfolio of small businesses, which eventually established itself as the country’s Small Business Innovation (SBIR) program in 1982. In 1983, MPE was awarded a Phase I grant titled, “Recent Advances in Photovoltaic Solar Indicate a Vast New Market May Soon be Emerging”. Over the course of that year, a 5 kW, phase-modulated, resonant power inverter  system was developed and tested in the basement and later moved to the first dedicated MPE site, located at 135 Route 10, Whippany, NJ, shown in Fig. 1. The new location had 2800 ft2, three phase power, and was zoned commercial. Fig. 1 First Magna-Power Electronics Site, Whippany, NJ (1983). The solar inverter, in Fig. 2b, was constructed with bipolar transistors which prevented the inverter from reaching the 95% efficiency target set by the grant. Although a Phase II was never awarded, four very important outcomes resulted from the project. First, a formal place of business was established. Second, the decision to go full time was made. Third, MPE had begun tooling itself for building large power converters. The completion of solar inverter gave the young company credibility that helped forge a relation with Chronar Corp. in Lawrenceville, NJ. Chronar commissioned three more solar inverter systems that were installed in Huntsville (AL), Port Jervis (NY), and Davis (CA). Lastly, a 5 kW ac-dc power supply and controllable load were built for testing the inverter, as shown in Figs. 2a-c, which were precursors for the power products that would eventually follow. Fig. 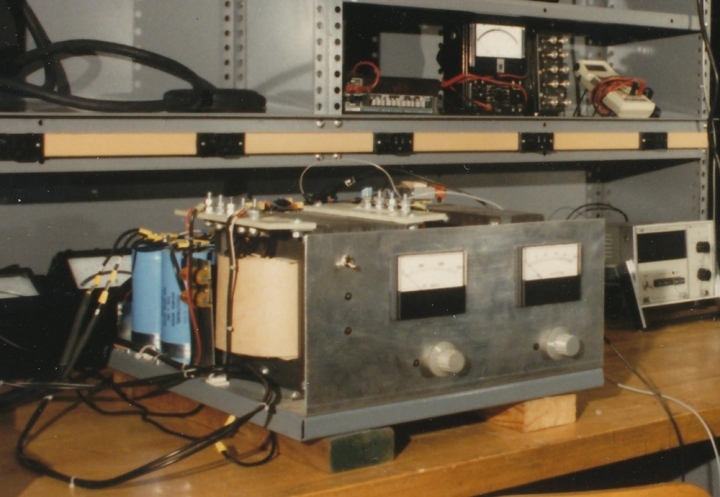 2a-c Experimental Setup for 5 kW Phase-Modulated Resonant Power Converter (1984). Introduction of the power MOSFETs and IGBTs in the late 70’s through early 80’s  made high-power processing more compact and cost-effective. The devices spurred development of new products and hence demand for higher-power test equipment. At the time, Electronic Measurements, Inc. (EMI) in Neptune, NJ, Power Ten, Inc. in Los Gatos, CA, and Hewlett Packard (HP) in Rockaway, NJ, dominated the high-power ac-dc supply market. These companies differentiated models by their input ac voltage, output dc voltage, and output dc current. Customers started contacting MPE to build custom supplies that filled gaps in existing product offerings. Each custom power supply model required a different power transformer design, wound to order. Pre-designed and stocked control, power, and filtering circuits that could be tuned and sized for different models. MPE had grown these competencies through its contract R&D business. Much of the design process was automated using spreadsheets so that Ira could offer competitive contract bids and turn designs around quickly. However, he did not have the mechanical expertise for the packaging, manufacturing, labor, nor sales management. He created a partnership in 1984 under the name Powertron with Robert Lesko, a client and owner of Amergraph Corporation in Sparta, NJ. Robert would supply the chassis, partial assembly, and handle product sales. 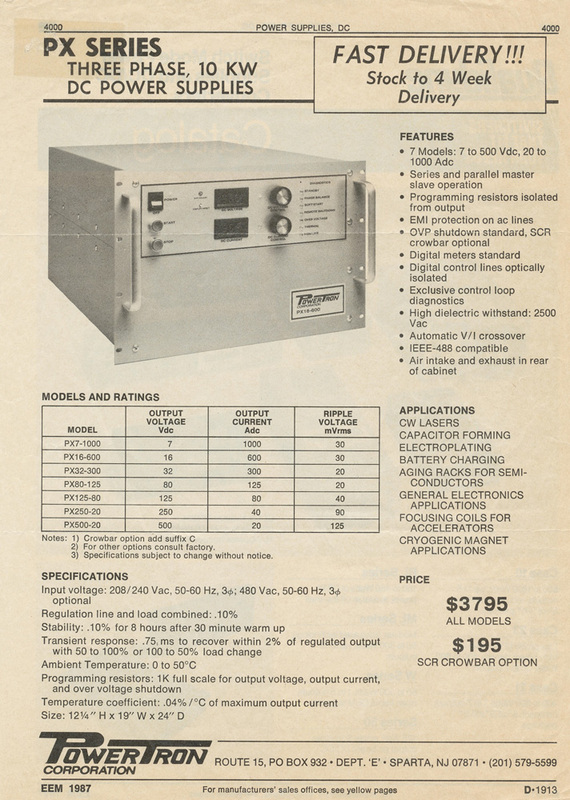 The joint product was called the PX Series, a 7U, 10 kW, ac-dc supply, as shown in the 1987 EEM advertisement in Fig. 3. The topology utilized a phase controlled SCR front-end, feeding a three phase transformer, rectifier, and dual LC filter. Fig. 3 Magazine Advertisement for the Magna-Power's First Ac-Dc Product: PX Series Supply (1987). Early in the relationship Powertron was approached by IBM personal computer division who needed two PX Series power supplies for a production line they were hastily ramping up. The opportunity was tainted by a two week delivery requirement. Robert was unable to dedicate the time away from his existing business to lend support. Ira purchased the remaining materials from Robert so he could complete production on his own. The partnership was further weakened by an outside trademark dispute with a company selling ac sources also under the name Powertron. The partnership was dissolved soon after to avoid a legal dispute. Delivery of PX Series units was met and IBM followed with an order for thirty more; MPE was now in the power supply business. MPE strategy was to provide customers with the widest product range possible. A standard product line would provide a cost and lead time advantage over firms making custom power supplies to order. Furthermore, a wide product offering would chisel away business from the established power supply vendors. To achieve these goals, a low-volume, high-mix electronics manufacturing operation was created. Extensive, multi-level bill of materials system was created for all the models. Common assemblies were leveraged to reduce inventory and speed production times. Every decision to bring an operation in house reduced costs and notched away at the lead time. The Whippany site, purchased as office space for R&D, was not suited for needed manufacturing operations: transformer winding, kitting, soldering, assembly, and final test. The entry doors were too narrow to fit large solar inverters and final testing had to done outside where some modules had to be removed to exit the building and then reinserted into cabinets. Only 600 ft2 was allocated for actual manufacturing space. Rented truck trailers were parked in the back for holding inventory. Whippany was not manufacturing friendly, making further expansion in the town difficult. 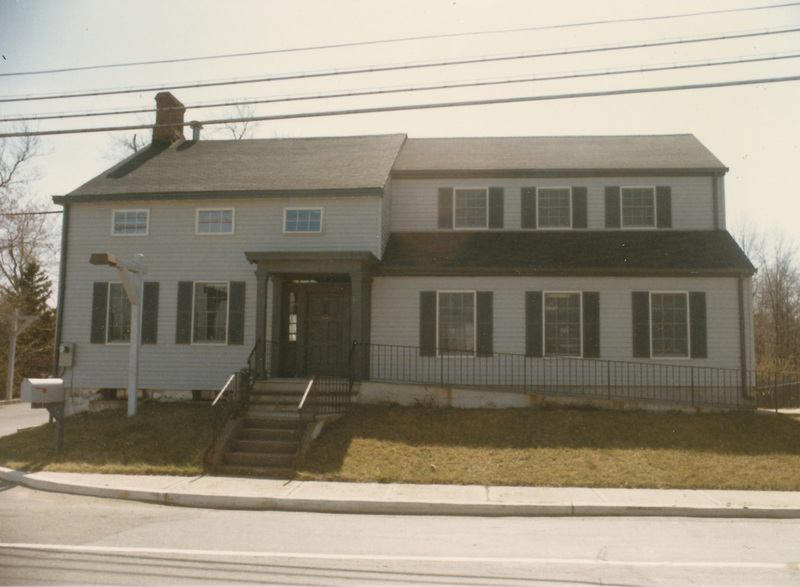 The decision was made to move in 1990 to 85 Fulton Street, Boonton, NJ. The 6,000 ft2 factory space supported a dedicated production line for the PX Series, room to hold a stockroom, and a bay door for handling larger supplies. The increased ceiling height and ventilation provided a safer environment for brazing copper bus work, welding, and spray painting locally sourced enclosures. Here, a second version of the load bank was created for burning in PX Series power supplies, as shown in Fig. 4a. Fig. 4a Magna-Power Load Banks Designed for Power Supply Burn (1990). Fig. 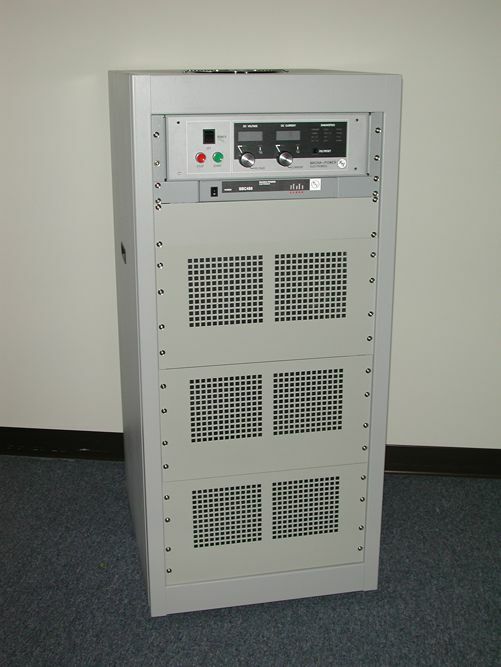 4b Third Generation Load Banks Designed for Power Supply Burn (2003). With only 405 units sold during the PX Series production run, the product did not achieve the sales volume necessary to support the company on its own. R&D projects and low-volume manufacturing contracts were still the primary source of income. However, the tooling, experience, and revenue from these activities were applied to the MPE product line. In 1996, computer communications with the power supply were introduced with a custom 1U control box called the SBC488. The external box supported RS232, RS485, and IEEE-488 (GPIB) interfaces through a proprietary protocol. The protocol could set and read 0-2V analog control and monitoring signals. The control option was reintroduced in 2001 as the SBC488A; this upgrade abandoned the proprietary protocol in favor of Standard Commands for Programmable Instrumentation (SCPI). With much competition in the low-power space (1-10 kW) from EMI and Power Ten, a strategy was formed to start grabbing market-share from the top. 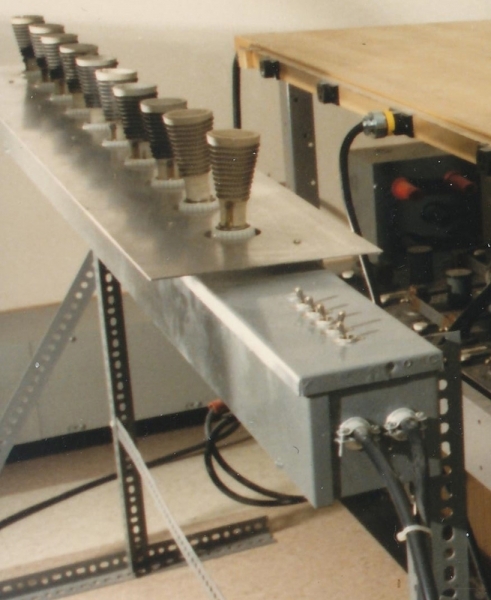 In July 1996, MPE shipped its first 100 kW TQ Series, a product that utilized a phase-controlled SCR front end, into a medium-frequency link current-source inverter. Despite its lack of features and performance, it was unique to the market and far more cost-effective than competitors paralleling multiple units or SCR power supplies with 50/60 Hz transformers. The SCR front-end quickly became obsolete, as it could not satisfy customer demands for low voltage ripple and fast recovery from load transients. MPE’s topology continued to evolve with the release of the rack-mount PQ Series in September 1998, spanning 3.3 kW, 6.6 kW and 10 kW power levels in a 3U rack-mount package. The PQ Series was MPE’s first IGBT-based product, designed to compete against Power Ten’s and EMI’s EMS Series, which contained similar communications interfaces and power density. MPE differentiated itself with current-fed power processing topology: a high-frequency polyphase chopper and IGBT inverter front-end with a medium-frequency link for ohmic isolation . Strong demand for the PQ led MPE to upgrade to a larger space nearby. At 81 Fulton Street, Boonton, NJ, the 10,900 ft2 provided ample space for the new product line. The printed circuit boards (PCBs) in the PQ Series contained surface mount technology (SMT), which was a first for the company. MPE leveraged local contract manufacturers for pick and place and solder reflow. Parts kitting and through-hole soldering were still handled internally. In February 2001, the rack-mount SQ Series and floor-standing MQ Series were released, featuring multiple interconnected PQ modules with a common gate drive signal to reach higher power levels. 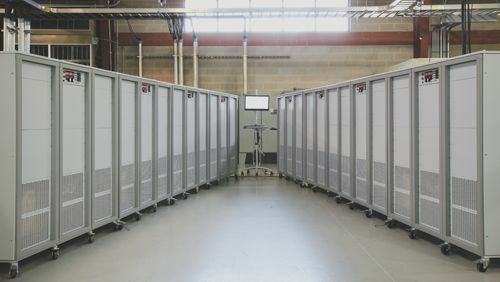 Up to 5 modules were interconnected within a single enclosure--transparent to the end-user--providing as much as 50 kW in a single rack. With a common controller and only two distinct designs, by 2001 MPE’s products spanned 3.3 kW to 150 kW. In 2002, MPE released its flagship products, the TS Series and MS Series, an evolution of the PQ, SQ and MQ Series. The rack-mount TS Series and floor-standing MS Series were built upon new 15 kW 3U modules, in increments up to 75 kW. This major improvement in power density was driven by lowered semiconductor losses and increased flux density in the magnetic designs. Despite MPE’s concentrated power supply development effort, transition to a product-based manufacturer was both gradual and transparent to the marketplace. With steady and reliable income sources from contract development, and recognizing MPE’s core strength was in engineering and manufacturing, MPE partnered with a number of established programmable power instrumentation OEMs for its dc power supplies. MPE’s income was split between contract engineering and its own product line. In 2002, MPE entered an OEM agreement with American Reliance, Inc. (AMREL) based in Fletcher, CA,to market MPE’s products under their own name. AMREL, with its own product offering of electronic loads and low-power programmable power supplies, had already established sales engineers and channels. In this strong partnership—an agreement containing 17 bullet points and a handshake—the two companies thrived together. Later, Chroma ATE Inc. in Taiwan was added as an additional OEM partner to help penetrate the Asia market. MPE’s growth spanning 2001 to 2011 was driven by OEM partners, who had a sales network and resources to support customers. MPE instead focused its efforts on improving its product line through investing in research, development, and reducing manufacturing costs. MPE was approached by United Technologies (UTC) in 2003 to provide 400 kW power supplies for testing the Boeing 787 Dreamliner’s auxiliary equipment. At these power levels, paralleling multiple TS modules would never satisfy power quality requirements. MPE developed a high-power chopper and IGBT inverter front-end, creating the MT Series line of high-frequency switched-mode power supplies at 100 kW and 150 kW. Following joint research with Prasad Enjeti, Ph.D. of Texas A&M University, a product line of harmonic neutralizers was developed to reduce total harmonic distortion for higher-power systems . 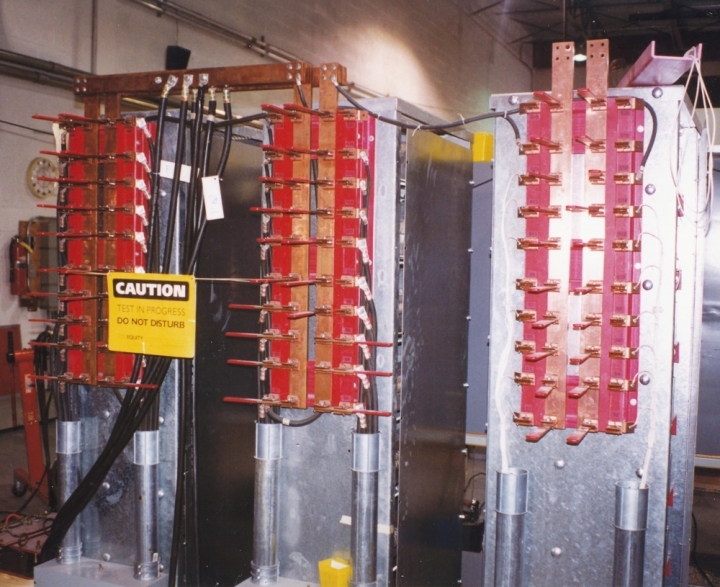 These harmonic neutralizers allowed for 12- or 18-pulse ac waveforms up to 600 kW. To evaluate its performance, the load banks were upgraded to support higher power and computer control, as shown in Fig. 4b. The MT Series was the largest standard product switch-mode supply on the market and was quickly adopted by aerospace companies worldwide. The optional features provided by the external control box, SB488A, had soon become standard features in most competing products. The embedded processing for the next generation of products, PQD and SQD,was moved inside the box to improve reliability, lower manufacturing costs, create new features, and build programmable power competency. In addition to features already provided by the SBC488A, the internal processors were used to control panel meters, keypads, setpoint memory states, step programming, and modulation. 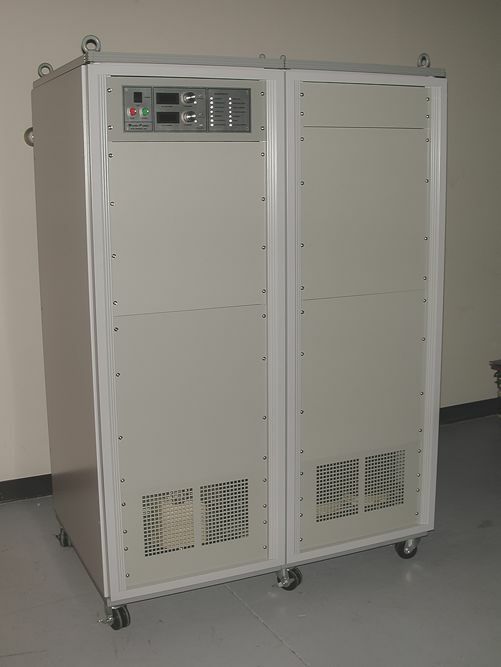 MPE shipped its first microprocessor controlled power supply in February 2004. 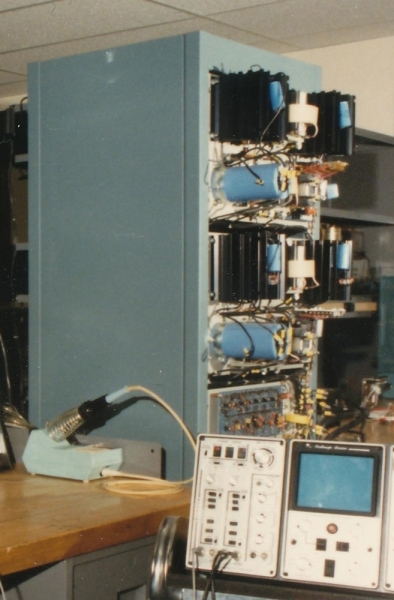 It had support for National Instruments’ LabVIEW, integrated RS232, IEEE-488, and a SCPI command-set. 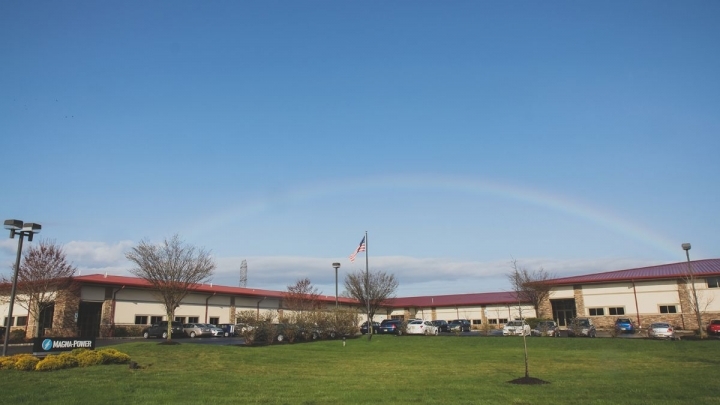 By mid-2004, with strong revenue and growth from its dc source line, MPE had again outgrown its facility in Boonton, both in manufacturing space and power capability. Under a newly founded subsidiary, BGA Properties LLC, MPE purchased 7 acres of land at 39 Royal Road in Flemington, New Jersey, 45-minutes from the Boonton facility. The new manufacturing headquarters was designed to be built in phases to handle future growth. Construction on the 27,500 ft2 Phase 1 plans began in early 2005. The project ran significantly over budget and nearly a year behind schedule. MPE finally moved its headquarters to Flemington in December 2006 and managed to retain nearly two-thirds of its dedicated employees, Fig. 5. The transition did not go smoothly and the company faced severe production issues and delays as it struggled to add new qualified personnel. Lead-times slipped to 16 weeks and the company began to lose customers and sales partners. During this time, MPE relied heavily on its OEM partners to wade through the transition to Flemington. By the end of 2008, sales through AMREL represented nearly 50% of the company’s revenue. When production and revenue stabilized, MPE resumed R&D activities and began systematically insourcing manufacturing operations, beginning with the highest cost item: heatsinks. With a deep economic recession well underway, MPE was able to acquire its first sheet metal punch press and other sheet metal fabricating equipment in early 2008. With this initial investment, MPE developed a strong competency in heat sink design and manufacturing, which would play a critical role in its future R&D activities. Funded by the US Navy, AMREL commissioned MPE to develop a water-cooled version of the TS Series. In May 2008, MPE released its water cooling option, which featured an internally manufactured air-to-water heat exchanger to cool semiconductors and the main power transformer. In April 2009, MPE released its 2U XR Series, with 54 models spanning 2 kW, 4 kW, and 6 kW power levels, making it the highest power, programmable dc power supply on the market at the time in its size. The product line was later expanded to include 8 kW and 10 kW models and output voltage ratings up to 10 kV. With rumblings in the marketplace that AMREL was in talks to sell its business, MPE faced an uncertain future leaving its sales in the hands of OEM partners. Adam Pitel, having joined MPE in May 2008, focused on developing sales and marketing and moving the company towards direct sales channels. Between 2008 and 2010 thirty-five sales representatives were added across the United States along with distribution in forty countries. Sales more than doubled. The XR Series would mark the first product line not sold through OEM partners. The creation of the United States American Recovery and Reinvestment Act of 2009 fueled activity in the central and micro inverter inverter markets. Inverter manufacturers needed to validate their products with high-power sources that could emulate solar panels. Determined to hit this market window, MPE launched a concentrated R&D effort to tailor its standard power supplies to emulate solar arrays. 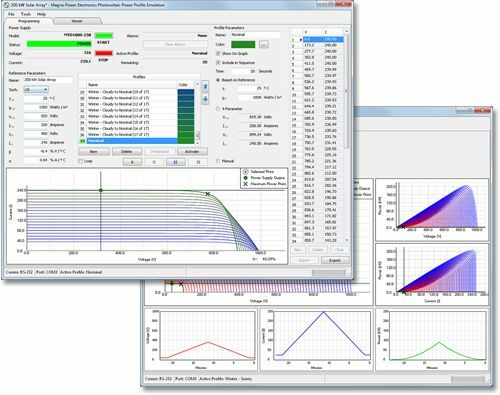 In January 2010, MPE launched its Photovoltaic Power Profile Emulation software (PPPE), which simulated non-linear solar array profiles with programmable temperature and irradiance. Grant Pitel, Ph.D. joined MPE in April 2010 and immediately went to work on improving the embedded control performance for PPPE. The high-slew rate output option was introduced in 2011 specifically for the solar inverter market. The option replaced electrolytic capacitors with film capacitors, increasing control bandwidth and making the supplies more robust to the harsh short circuit tests specified in UL 1741. In August 2010, AMREL’s Power Division was acquired by AMETEK, Inc. By this date, sales through AMREL represented less than 10-percent of MPE’s revenue and, due to conflicting products and sales channels, MPE decided not to continue its OEM relationship. By September 2013, MPE had ended all of its OEM relationships for its power supplies and contract developed products. By this date, all development and manufacturing resources were dedicated to the company’s standard line of programmable dc power products. MPE was continuing to push new ways to reduce its lead-time, improve quality, and reduce manufacturing costs. Funded by improved margins from direct sales, new operations and machinery were routinely added to the company. MPE developed shunt manufacturing capabilities, added wire electro-discharge machining, powder coating, automated CNC machinery, and upgraded all sheet metal equipment. Sheet metal operations were expanded to include chassis and laminated bus bar fabrication. Magnetics operations were expanded to include machinery for shearing and bending steel cores and grinding ferrite cores. The expanded operations enabled MPE to quickly prototype new products and significantly drop the lead-times for its existing products. New enterprise resource planning software was deployed to manage jobs on the production floor and track inventory and sales. Fueled by new growth from renewable energy and electric vehicle markets along with the need to house new internal operations, MPE broke ground on Phase 2 of its manufacturing facility in March 2011, which more than doubled the factory’s size to 56,500 ft2. Driven by demand for higher-power products, particularly among central solar inverter manufacturers, MPE released the 250 kW MT Series in June 2011 with an integrated 12-pulse harmonic neutralizer [fig]. Using this building block, MPE was now able to scale its high-performance power supplies into the multi-megawatts. In July 2012, MPE announced the opening of its first international sales office, Magna-Power Electronics GmbH led by Wolfgang Winter Ph.D. and Zuzana Wood, to support the growing demand for MPE products in Germany and the surrounding countries. With strong continued growth both in the US and internationally, in February 2015, MPE announced the opening of its second international sales office, Magna-Power Electronics Limited, led by Bob Collins in the United Kingdom. In February 2013, MPE released its SL Series, which now delivers 6 kW in a 1U rack-mount package, doubling the amount of programmable power compared to its next closest competitor. The SL Series provided the final piece of what MPE’s sales partners and customers had demanded for years: a complete product portfolio from 1.5 kW to 2000 kW+ with common firmware, user interface, and control architecture. With an overwhelming demand for MPE’s higher volume SL Series, in June 2013 the company broke ground on the 16,780 ft2 Phase 3 final addition, bringing the total facility size to 73,530 ft2. MPE used this addition to internalize all automated surface mount operations, which was viewed as the company’s final step for vertical integration. With the addition of a surface mount stencil printer, pick and place, reflow oven, wave- and selective-solder machines, and automated optical inspection, MPE was no longer dependent on any suppliers for critical operations to build its products. Each major release of a dc power supply product line led to an internal load bank development for power supply burn-in, as shown in Figs 3c and 4a-b. The new lower-power higher-volume products were occupying test stations and load banks. To support MPE’s own needs and leverage its past experience, MPE developed a new type of load topology , where most of the power is dissipated across a switched-resistor matrix. High-speed loading dynamics is handled through series-connected linear devices at lower power. Dumping power across inexpensive passive resistors instead of silicon MOSFETs provides lower cost and offers unique performance advantages, when compared to conventional linear loads. Following over three years of R&D, in April 2016 MPE released the MagnaLOAD dc electronic load product lines. All lines launched with MagnaLINK™, a distributed multiprocessor control architecture, and MagnaWEB, a cross platform server client software interface. Within the new MagnaLOAD offerings, the WRx Series could dissipate up to 12.5 kW in 4U using an internally designed and manufactured micro-channel, water cooled heatsink, with scalability into the megawatts. The US Navy was the first customer for the new product, selecting MPE to deliver a 1 MW, water-cooled, high-performance electronic load , used for validation of dc power architectures for next-generation electric Navy ships. MPE’s early foundation in power electronics design and software automation provided a strong foundation for the manufacturing company that followed. Continual reinvestment of profits back into R&D and operations allowed MPE to be competitive in the marketplace and furthermore, led to the vertically integrated manufacturer that Magna-Power is today. After 35 years and 260 MW of power products delivered, MPE is prepared to enter its next generation and the next 35 years that await. E. L. Owen, "SCR Is 50 Years Old," in IEEE Industry Applications Magazine, vol. 13, no. 6, pp. 6-10, Nov.-Dec. 2007. I. J. Pitel, "Phase-Modulated Resonant Power Conversion Techniques for High-Frequency Link Inverters," in IEEE Transactions on Industry Applications, vol. IA-22, no. 6, pp. 1044-1051, Nov. 1986. K. Shenai, "The Invention and Demonstration of the IGBT [A Look Back]," in IEEE Power Electronics Magazine, vol. 2, no. 2, pp. 12-16, June 2015. I. J. Pitel, "High-Power DC Power Supplies," in Evaluation Engineering, vol. 7, iss. 44, pp. 50, Apr. 2005. S. Choi, P. N. Enjeti and I. J. Pitel, "Polyphase transformer arrangements with reduced kVA capacities for harmonic current reduction in rectifier-type utility interface," in IEEE Transactions on Power Electronics, vol. 11, no. 5, pp. 680-690, Sep 1996. Ira J. Pitel, Grant E. Pitel, Adam J. Pitel, “Electronic loads,” U.S. Patent 9 429 629, August, 30 2016. Magna-Power Electronics incorporated in New Jersey as an electronics R&D consulting company. Magna-Power awarded Phase 1 SBIR grant for 5 kW phase modulated solar inverter. Magna-Power moves to first commerical building, 2800 ft2 in Whippany, New Jersey. First commercially available power supply released under PowerTron brand name. The SCR-based PX Series spanned 7 models up to 10 kW. Magna-Power acquires assets from PowerTron and internalizes production of PX Series, its first line of DC power supplies as a complement to on-going consulting work. Magna-Power moves to 6000 ft2 facility in Boonton, New Jersey. The first TQ Series power supply is delivered, offering 100 kW and 150 kW models up to 1000 Vdc, with a phase-controlled SCR front-end and medium-frequency link. 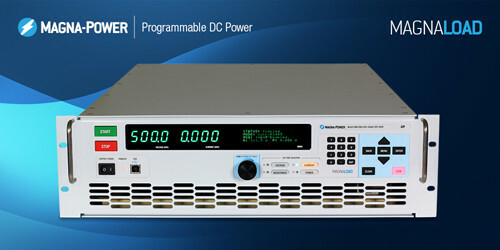 With funding provided on-going consulting work, Magna-Power develops its signature current-fed power processing topology, launching first on the flagship PQ Series offering 3.3 kW to 10 kW in a 3U rack-mount package, with computer controls through a external controller called the SBC488A. Higher power levels are achieved by internally master-slaving multiple PQ Series modules. The SQ Series and MQ Series are launched, spanning 13.3 kW to 50 kW. An OEM agreement is reached with American Reliance (AMREL) to private-label Magna-Power products. Several additional OEM agreements followed, as Magna-Power focused on engineering and manufacturing operations. The 100 kW and 150 kW MT Series is launched to replace the TQ Series. The MT Series offered the same current-fed inverter front-end as the PQ Series, but scalable into the megawatts with harmonic neutralization to maintain AC power quality. Strong demand was driven by aerospace industry in support of hardware development for the Boeing 787. A new universal controller and updated front panels are launched acrossed the entire product line with an integrated controller, IEEE-488, RS232, SCPI commands, and external user I/O for PLC integration. Magna-Power moves into 27,500 ft2 Phase 1 of its new headquarters in Flemington, New Jersey. The 2U XR Series is released, spanning 2 kW to 6 kW, providing industry leading power density. The product was later increased to 10 kW, still in 2U. AMREL is acquired by a competitor and Magna-Power begins building its own brand name with direct sales channels. The company begins to end all OEM relationships. Dynamic solar array emulation capabilities are added to all Magna-Power products with the release of PPPE Software. Magna-Power breaks ground on Phase 2 addition, more than doubling its factory to 56,500 ft2. The 250 kW MT Series is launched with an integrated 12-pulse harmonic neutralizer and models up to 4,000 Vdc. With increasing demand in Europe, a Magna-Power sales office opens in Germany followed by a second office in the United Kingdom a few years later. The 1U SL Series is released, spanning 1.5 kW to 4 kW, again with industry leading power denisty. It was later expanded to 6 kW. Magna-Power breaks ground on Phase 3 addition, bringing its factory size to 73,530 ft2. The MagnaLOAD product line of DC electronic loads is release, spanning 3 product series from 1.25 kW to 120 kW+, with an all-new digital controller called MagnaLINK™. Magna-Power is awarded 2016 New Jersey Manufacturer of the Year.Magna-Power is awarded 2016 New Jersey Manufacturer of the Year.